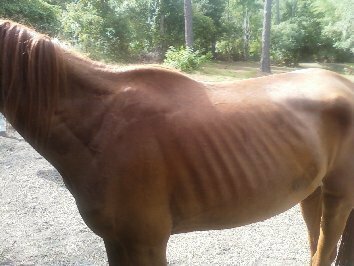 Moon Light..........Arrived starved, rain rot, neglected hooves, eyes with no light, lameness in her right rear leg and no strength. I actually slept in the stall with her for the first couple of weeks she was here. She was so weak I didn't want to leave her. Moon Light is a Tennessee Walker. She's 26 years old now and still doesn't know she's full. Moon Light is sweet & always ready for treats :) Moon is adored by our high risk teenagers. Due to her starvation, she has permanent stifle joint issues. Fancy..........Arrived under weight but in far better shape physically than the other 10 horses. Her spirit and attitude were another matter. 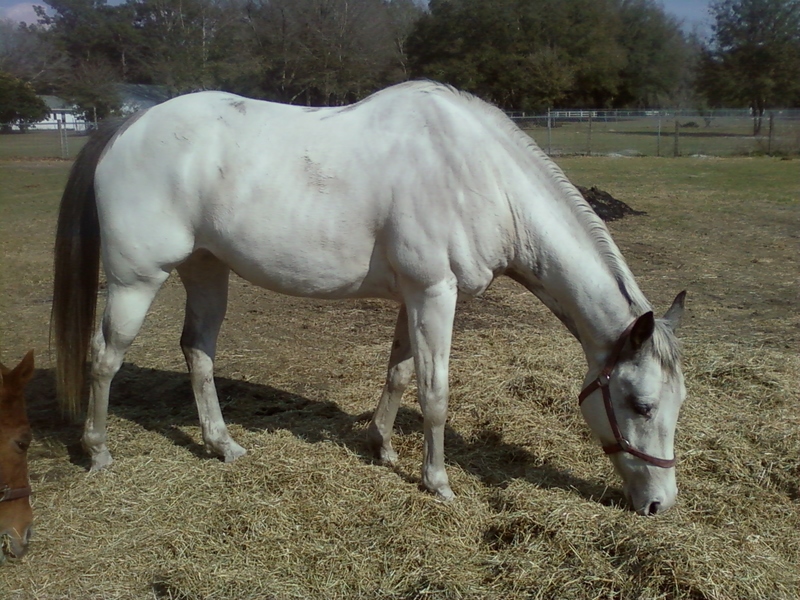 She's a beautiful 21 year old quarter horse. She was a hard case to crack the emotional scars. We adopted her out, but she returned after a mutual agreement that home was the best place for her. Upon her return Fancy was so obviously happy to be home that she did a complete turn around and was one of our best therapy horses for our teen program. 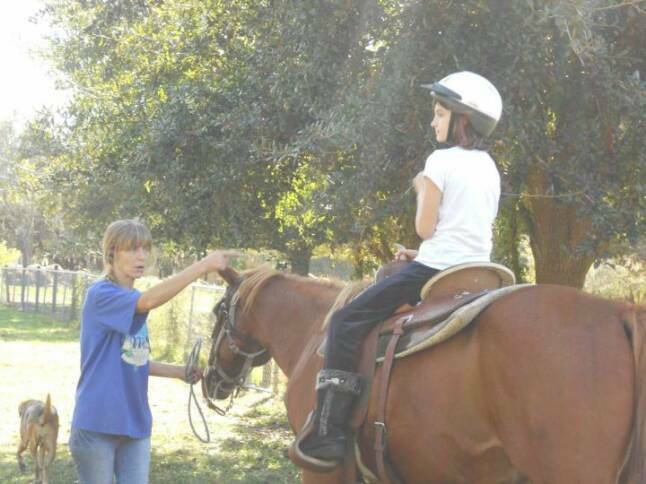 She has become a loving, calm and patient horse, who loves her job. 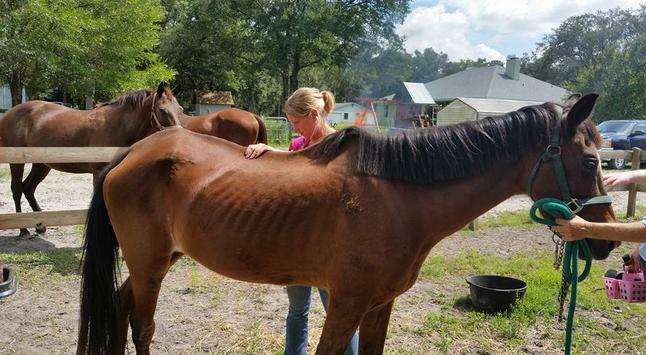 Pixie ......is a large pony mare, She arrived here June 2010, starved, horrible rain rot on her body and legs, with a mistrusting attitude and never broke to ride at six years old. Pixie is trained now, We did adopt her out, but her new owner passed away. 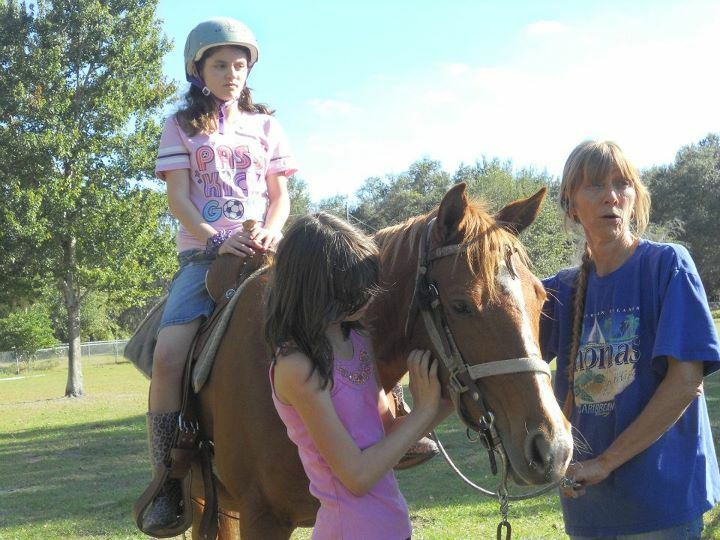 She was returned here and became a therapy horse for a child. Pixie is now 14 years old. 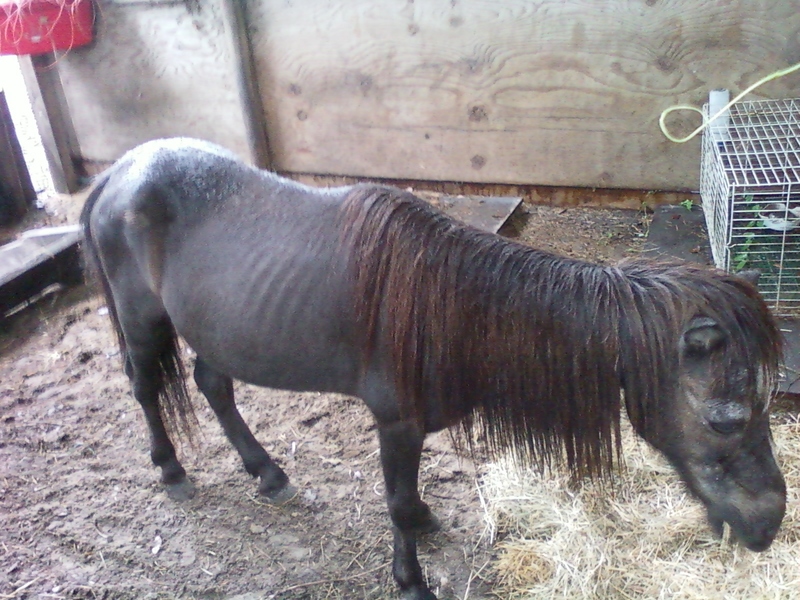 Cracker..........Arrived starved, rain rot, with right front hoof cracked into band and 1/2 her right back heel missing. She also had a very hard time with trust. 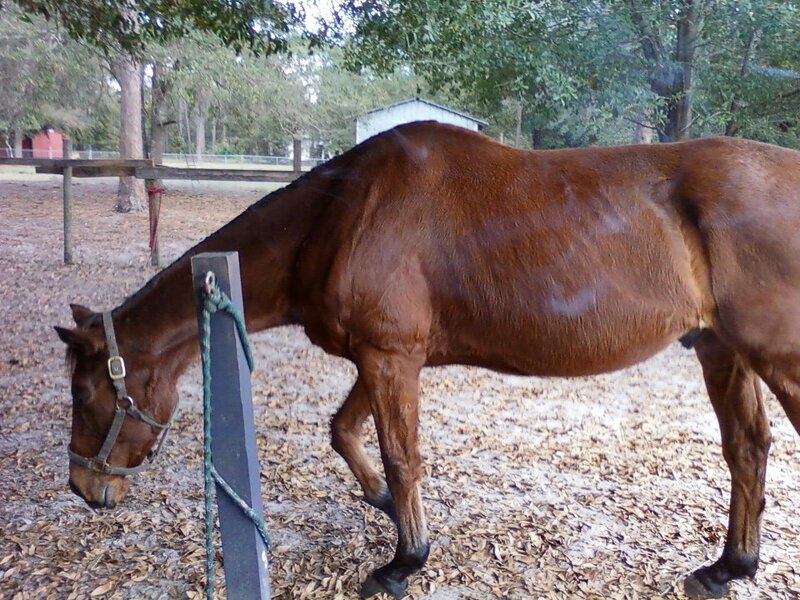 She is now a healthy horse, though with her injuries can't be ridden hard or for sport. She is fine for trail rides. 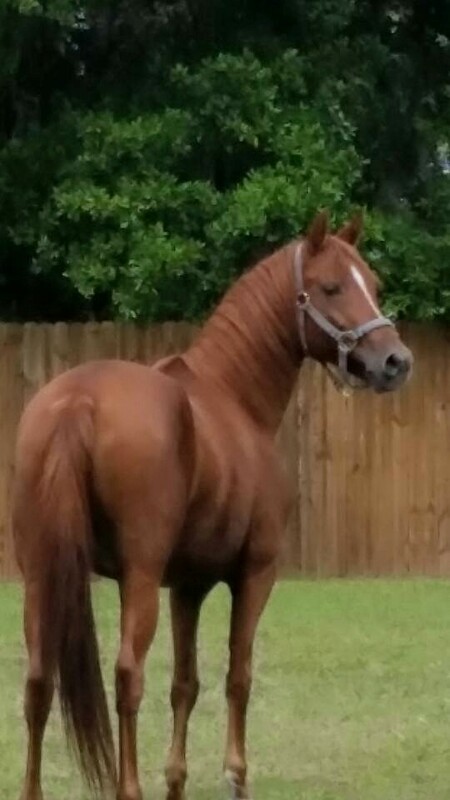 She's a 17 year old grade mare. 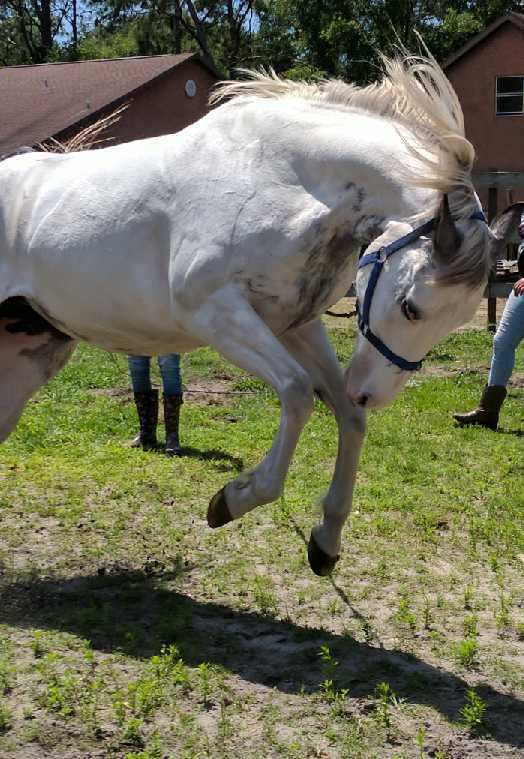 Cracker is a therapy horse in our teen program. Echo.........Arrived here Dec 2011 and is now 19 years old. She is a Paso cross mare. She was never broke to ride. Has serious attachment issues and limitations. She lives her life in sanctuary with Misty as her sight horse on Mystic Acres Farm. 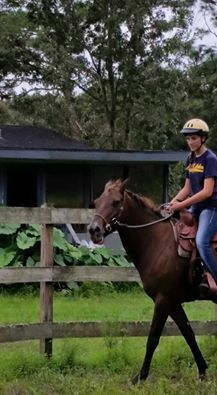 Deputy.......... is an 11 year old gelded mini. Deputy arrived here after being first rescued from a pool enclosure that he was living in with dogs, who were using him to chew on. Surprisingly he doesn't mind dogs. 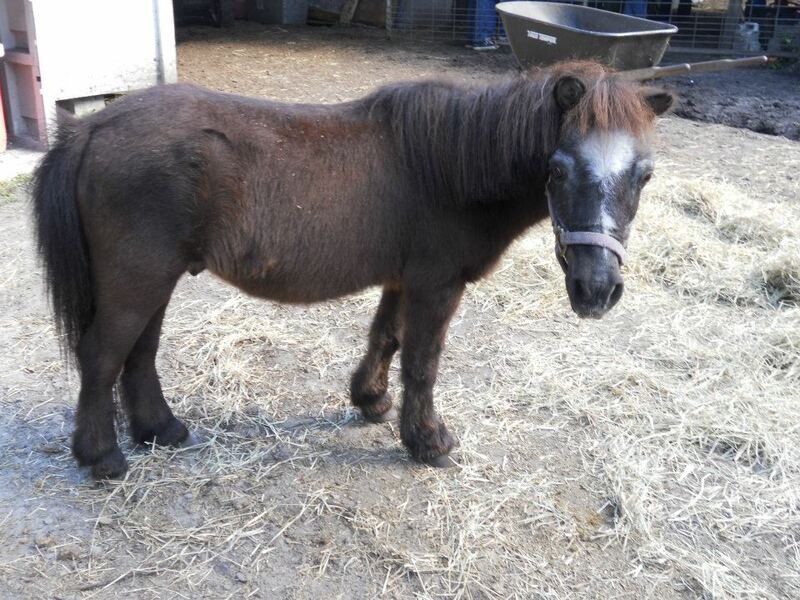 His wounds healed and he's living the good life in a happy ever after home, complete with a mini barn! ADOPTED by Monica, Ron & Luke !!! 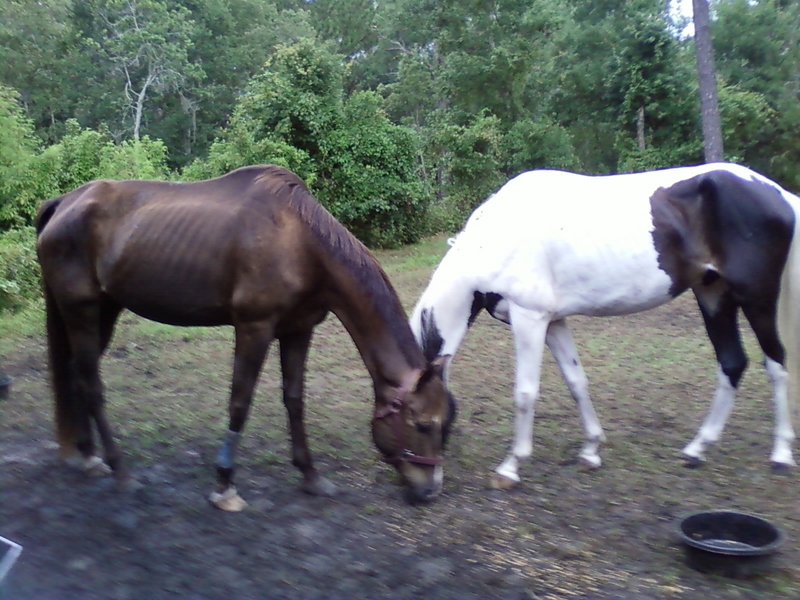 Lola, Lacey & Magic .....arrival June 2010 - All covered in rain rot and Magic and Lola seriously under weight with long neglected hooves. They are happy on their 400 acres of lush tifton grass and beautiful barn in their new home with Stacey Johnson in Dade City. Tatonka........ Arrived here in August 2011, starved, covered with rain rot and hadn't had any vet care in six years. He lived in a dirt pen alone with no hay to free feed on and nothing to graze. He hadn't seen a farrier in at least two years. No shots, no coggins, no teeth floats. The owner told me he was 8 years old, but he is 18 years old. Because of his lack of body weight, muscle mass and body fat, his stifle joint was out in one rear leg, leaving it useless. We had our vet go to his location, pull a coggins and manipulate the stifle back in joint. Tatonka recovered well. It's amazing what a good diet and some grooming will do folks He now resides with Deputy and the Moses family. We are so completely grateful that this little guy will live his life out having another mini buddy and so much love from the family! Adopted by Monica, Ron, Luke & Jessee Moses! He & Deputy are happy to be rejoined and live their lives out together! Chief .........a 13 year old TB. Chief ran 11 races and broke his right shoulder, but is sound for trail riding. He was destined for the slaughter pipeline when the folks that brought him here rescued him. He arrived under weight, needing teeth floated a couple of times and a good diet. Chief his forever home with the Spate family. 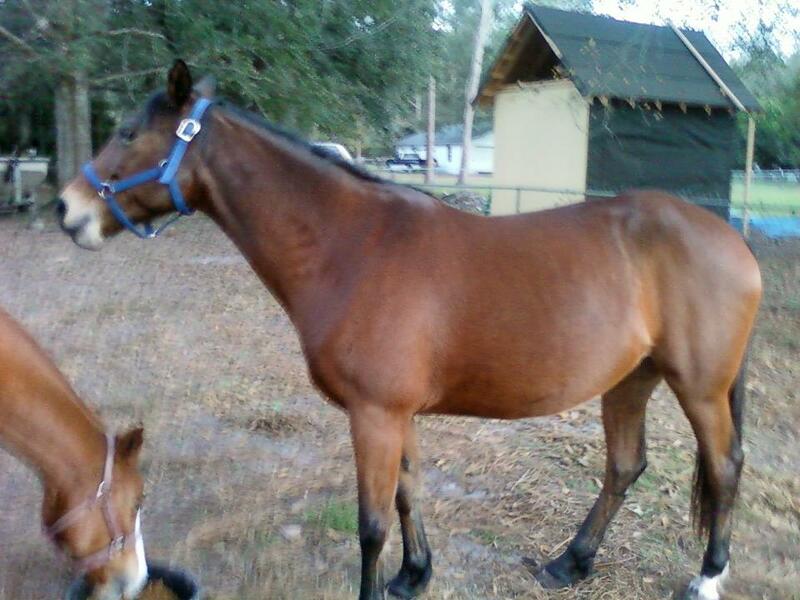 Rascal...... was rescued, vetted and gelded in November 2012 and was 2 years old. 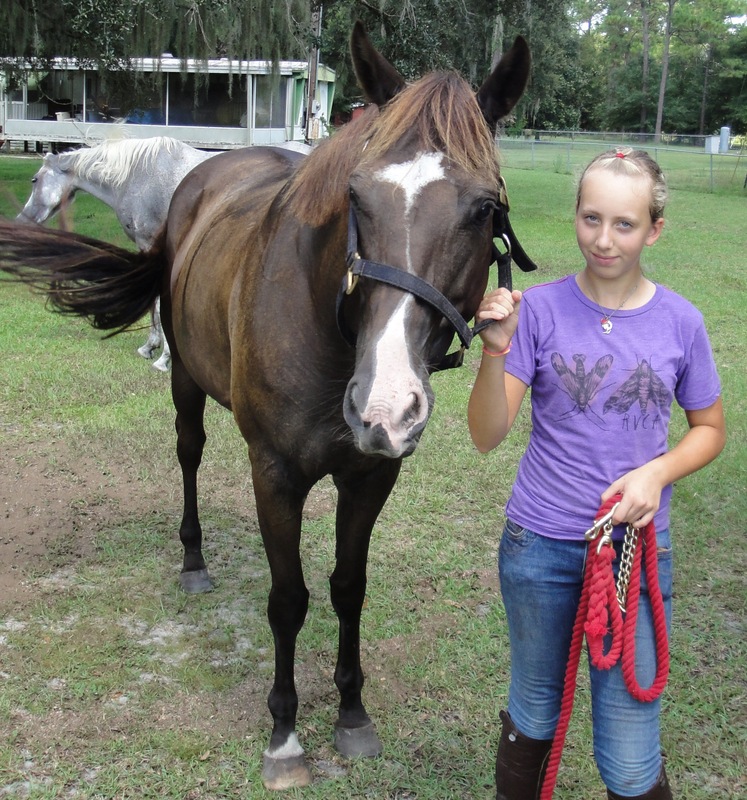 He was adopted by a wonderful family in Zephyrhills. Molly & Dominic...... Molly & Dominic arrived untouchable, They were soon fattened up, easy to handle after being shown a little love and some patience. Dominic was gelded. 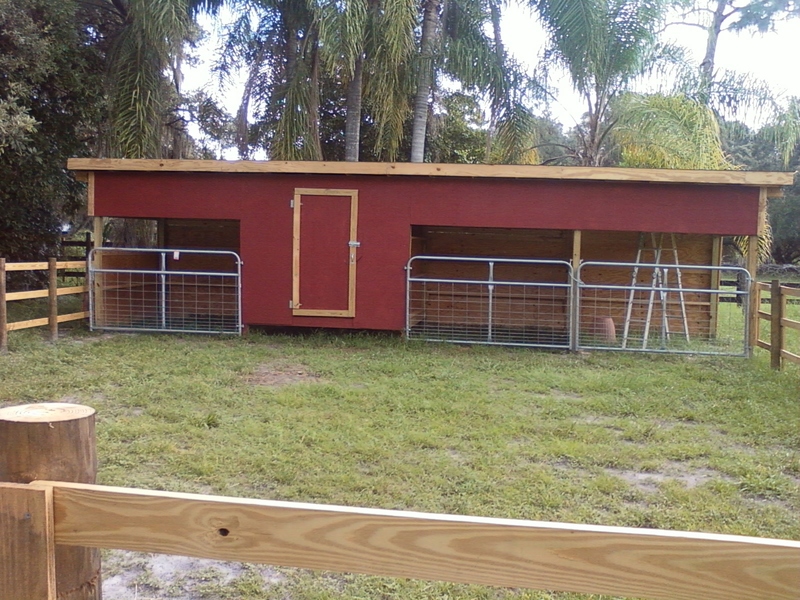 They were adopted to a wonderful woman named Care, in Ocala on a beautiful farm for pets. 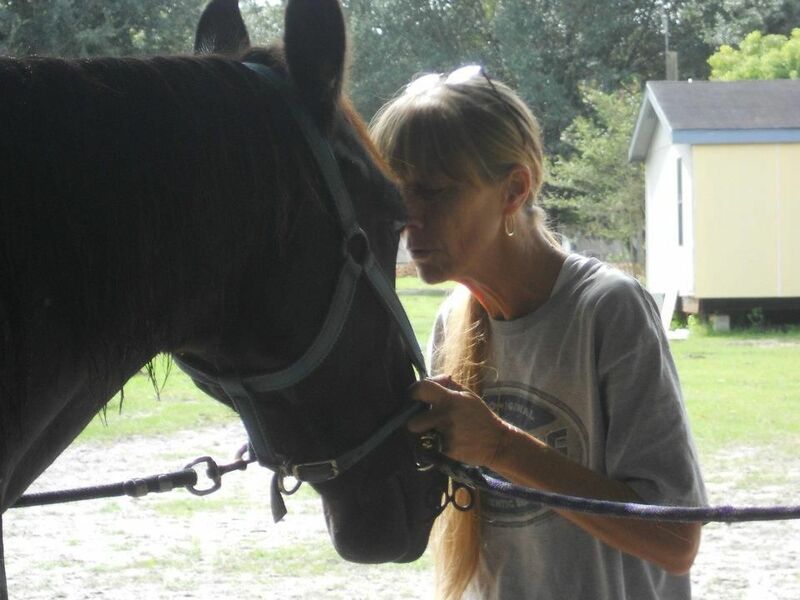 ​Warrior.......Arrived here Feb 2012, an wild, abused and very neglected Mustang. Warrior was 13 years old. 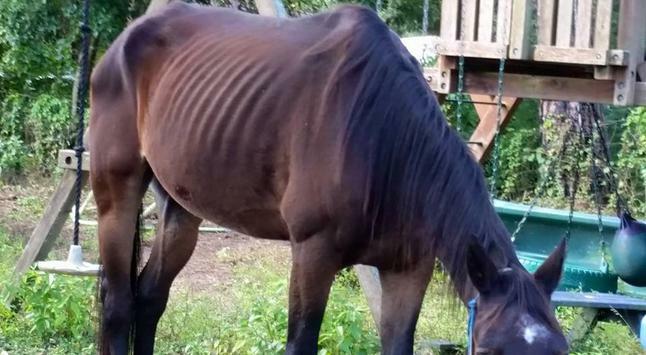 He had known nothing but neglect and cruelty since being stolen by the BLM from his federally protected band as a 7 month old colt. The BLM continues at a rapid rate to destroy our herds of Wild Mustangs and Burros, despite Federal Laws in place to protect them and the tax payers clear voice to leave them alone. Warrior was adopted by the Smeltzer family. He resides at Mystic Acres Farm which is owned by the Smeltzers, living as a Mustang, free to graze the rest of his days. 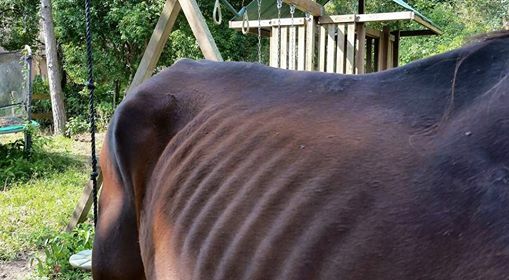 Goose ..........arrived here a 4 year old mare, starved, very angry, with hooves in need of attention, needing teeth floated and all innoculations. She is now, a 13 year old predominately white Sabino with roan patches. Goose was adopted at one time, but had to be brought back to our rescue due to the owners moving out of state and not being financially capable of taking care of her properly. Goose developed eye cancer in her right eye upon her return. 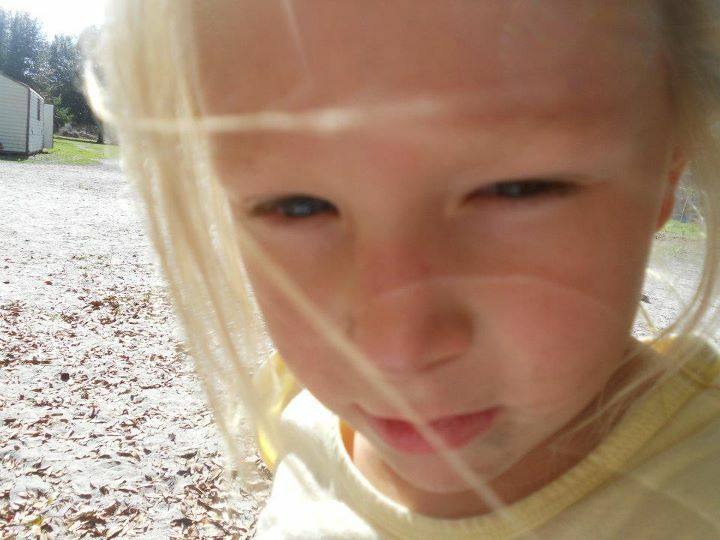 We chose to do local surgery and chemo beads, instead of taking her eye. Over two years later, she is holding her own. 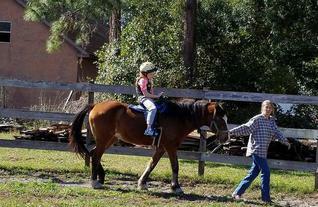 Goose is a therapy horse and serves the children well. Brandi......... Arrived here with Moe, suffering an embedded nose band into her bottom jaw and emaciated. Her wounds were horribly infected, but she stood and was a trooper at having it peeled out and her wounds treated. Brandy's wounds healed nicely with no real scaring. She is an Appy about 16 years old, without much of a blanket. 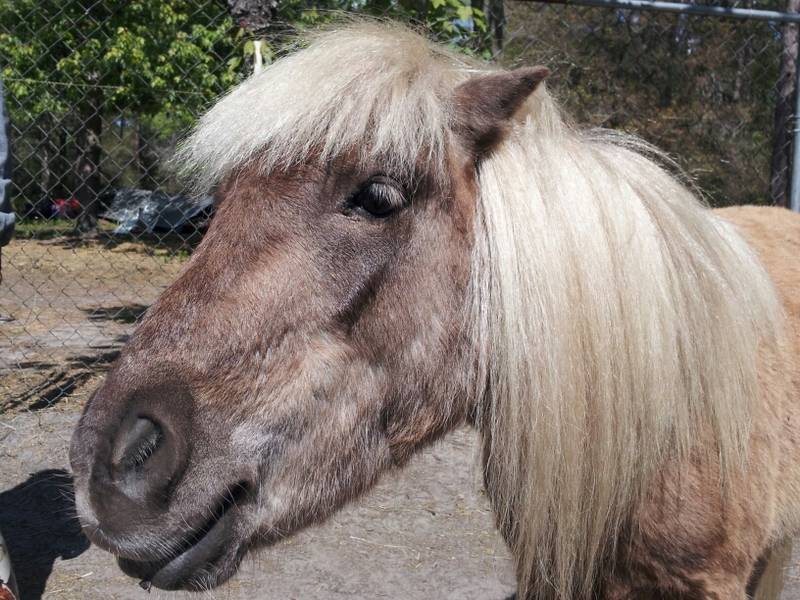 Brandy is a therapy horse in our teen program. 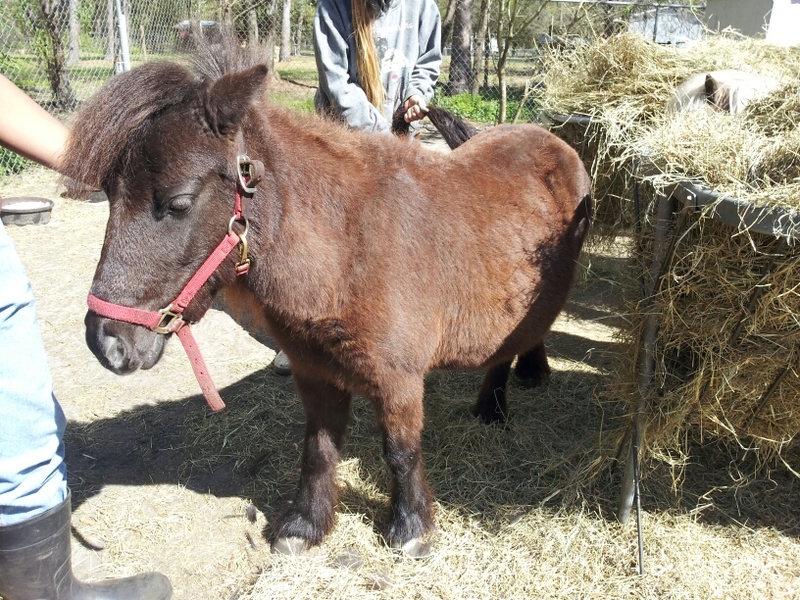 Bobby......is a Pony now about 6 years old. We got him at the Hernando County Animal Shelter after seizure and auction. He was intact and was gelded immediately upon arrival. Bobby was untouchable, wild, and very frightened on arrival and was just a baby. 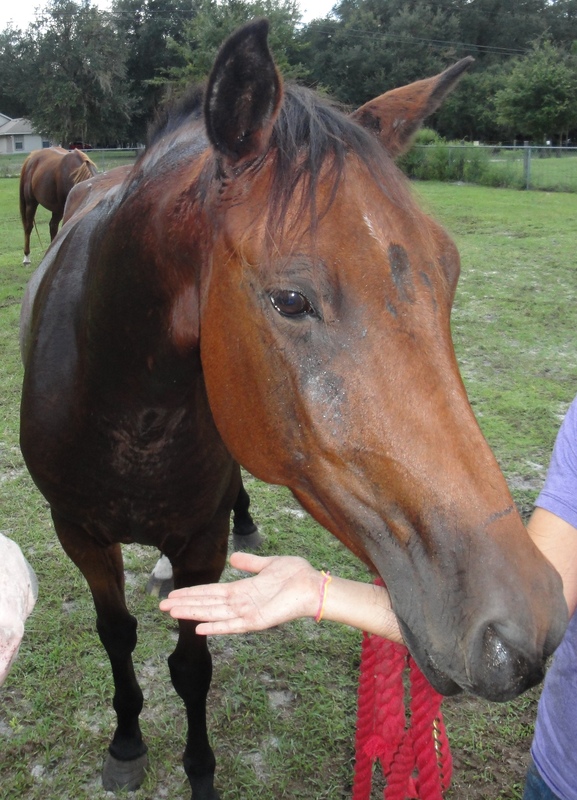 He along with Renegade were scheduled to euthanized when a volunteer at the shelter contacted me. Bobby spit one of his baby teeth out in one of our youth volunteers hand. He was a under weight and has skin allergies and his rear suspension is broken down. He is now trained to ride, but can only be light walked, with a light rider. 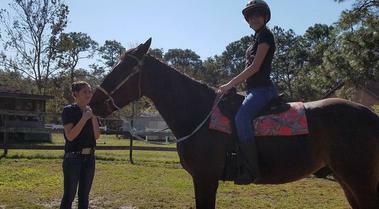 Bobby serves as a project horse in our teen program. 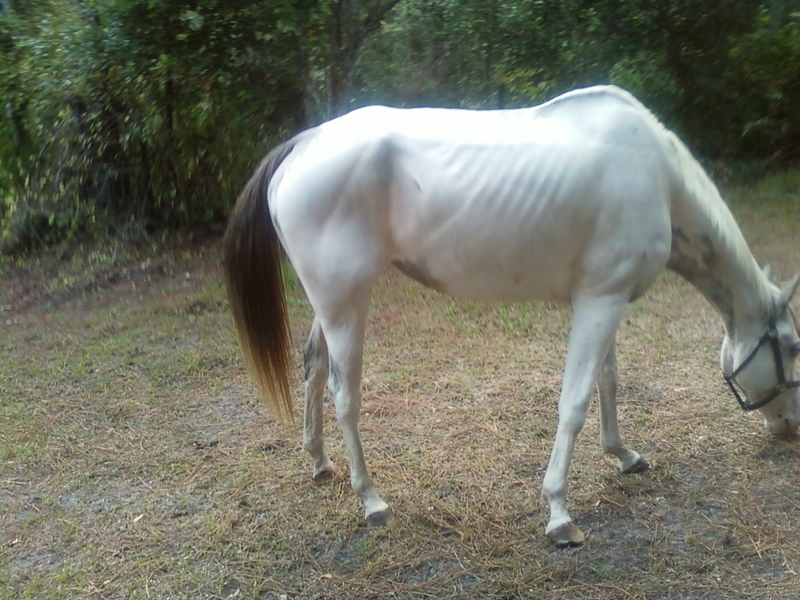 Renegade........ Is now about 10 years old and an endangered Florida Cracker horse. We rescued him from Hernando County Animal Shelter on 3-9-12. 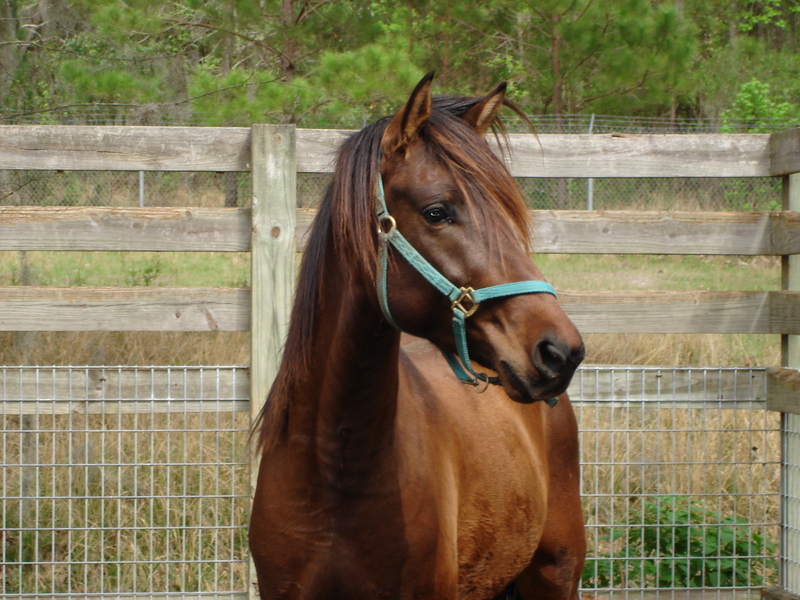 Renegade was a young Stallion, who we immediately gelded. He was deemed "crazy" at the shelter and wasn't touchable. 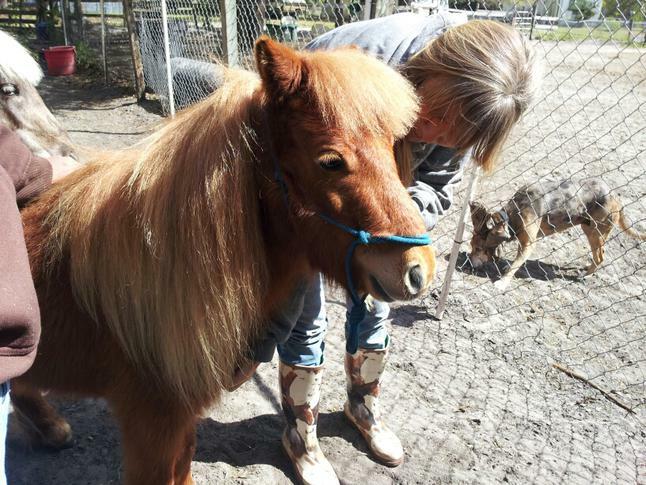 He and Baby Bobby were both to euthanized. 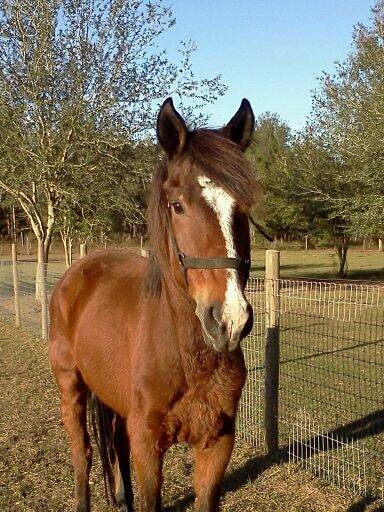 Florida Cracker Horses are a Florida breed and endangered. Renegade was abused badly to include hobbling and being beaten with a 2 x 4. He is GORGEOUS but mentally has not forgiven mankind for his early treatment. I am the only one at this point who can handle him. Just like humans, abused animals can take a life time to heal mentally. Renegade has all the time he needs. Chino....... arrived September 22, 2015. Emaciated and in the beginning stages of kidney failure from dehydration. 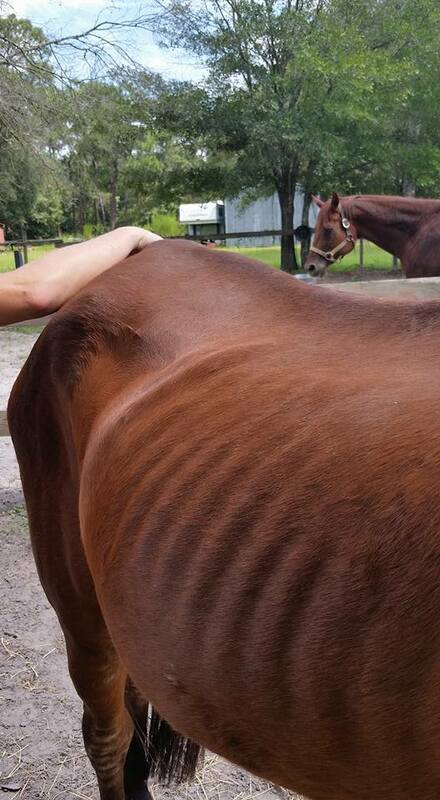 In 3 weeks time, Chino gained 68 pounds and just over a month later, looked like a different horse. 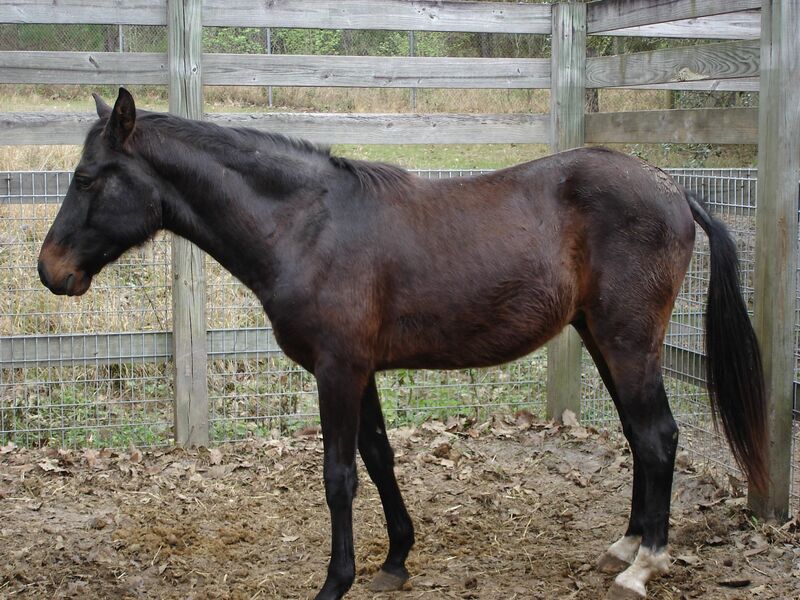 Chino is a 32 year old Morgan mix mare, with a sweet disposition a hit with the children we have here in our program. Cooper.....Arrived here October 13, 2015 after a brief stop over with a caretaker. Cooper came from the same farm that Chino came from. Cooper was severely under weight at over 16 hands high and weighing in at 834 lbs. Cooper is a Standardbred and at some point had a racing career, as is tattooed on his lip. He is at least 22 years old. Cooper sustained injury to his right front leg in his career and isn't adoptable. Cooper is a therapy horse in our teen program. in at about 1200 pounds now.